Ever since I read the Crazy Rich Asians book franchise and saw the film, I had wanted to visit the beautiful country of Singapore. I was lucky enough to get the chance to visit in January thanks to partnering with Singapore Airlines for the trip of a lifetime to both Singapore and Vietnam. I also had the chance to bring my mom along with me, and when we flew over to Vietnam we made sure to visit her hometown of Da Nang. Apart from the beautiful resorts and tourism, it was so inspiring to see the home my mom grew up in before she immigrated to the US. Here, I’m sharing some highlights from my trip to along with places for you guys to visit if you ever find yourselves heading to Singapore and/or Vietnam! For this trip, I had the opportunity to partner with Singapore Airlines, who helped organize my travel. This made it super easy for me to fly directly to Singapore from LA without any connections. International travel can get tricky if there are too many stops along the way, so it was great flying with Singapore Air. The flight from LA to Singapore was 17 hours and 50 minutes, and while it was a long one, the experience with Singapore Air made it so smooth. Singapore Airlines is known for having some of the best in-flight experiences in the business, and they surely didn’t disappoint. I had plenty of legroom, a variety of entertainment options, and several meals throughout the flight. It’s also important to note that Singapore Air caters to different dietary restrictions. It was probably the most comfortable flight of my life, and that’s saying a lot! We also flew to Vietnam halfway through our trip with the airline. In Singapore, I stayed at the beautiful Four Seasons Hotel Singapore on Orchard Road. The hotel has panoramic views of the entire city, a rooftop pool, and is located in the shopping hub of Singapore. In Vietnam, I stayed at the Four Seasons Resort The Nam Hai, Hoi An. It’s a luxury beach resort with poolside villas, spa amenities, and so much more. It’s the perfect place to stay if you want seaside relaxation. Jiang-Nan Chun: Located inside the Four Seasons, Jiang-Nan Chun features delicious Chinese cuisine. The restaurant itself is beautiful with its rustic decor. Makansutra Gluttons Bay: Here you can enjoy a variety of Singaporean street food in Marina Bay. It’s perfect for anyone who likes to dine outside as there’s a gorgeous view of the open sky. One-Ninety Restaurant: While I came here for breakfast, it’s a great restaurant for all of the steak and seafood lovers too. In the mornings enjoy a variety of continental, American, Chinese, Japanese dishes, along with healthy juices. For lunch and dinner, choose from salads, a raw bar, noodle dishes, and prime seafood and meats. La Sen: This is a great beachside restaurant for lunch where you can enjoy a mix of comfort food and traditional Vietnamese dishes. It’s located inside the Four Seasons. Cafe Nam Hai: I started my day here with breakfast. There was a great selection of fresh fruit, including local honeycomb, pastries, and more. Hoi An Streets & Eats: This is another big street food scene, and perfect for when you’re feeling very hungry. Taste some of the best local Vietnamese dishes from different vendors. If you do a proper food tour, it can last up to four hours! 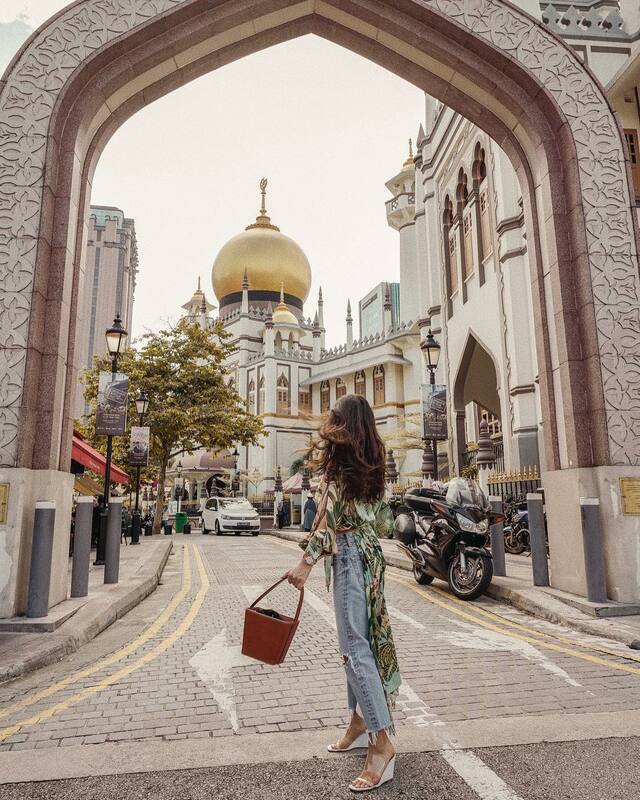 Visit Kampong Glam and Katong: At Kampong Glam, we saw the Sultan’s Mosque and explored old-fashioned shops selling batiks, carpets, and more. At Katong, we visited the colorful Peranakan Houses in the Joo Chiat area. Shop on Orchard Road: As I mentioned earlier, Orchard Road is the shopping hub of Singapore, so it’s clearly a hotspot. It’s full of designer brands, boutiques, spas, salons, hotels, and restaurants. Gardens by the Bay: This is one of the top places to visit in Asia, so of course I had to check it out. The garden is home to two conservatories and within the gardens, there are 18 Supertrees. 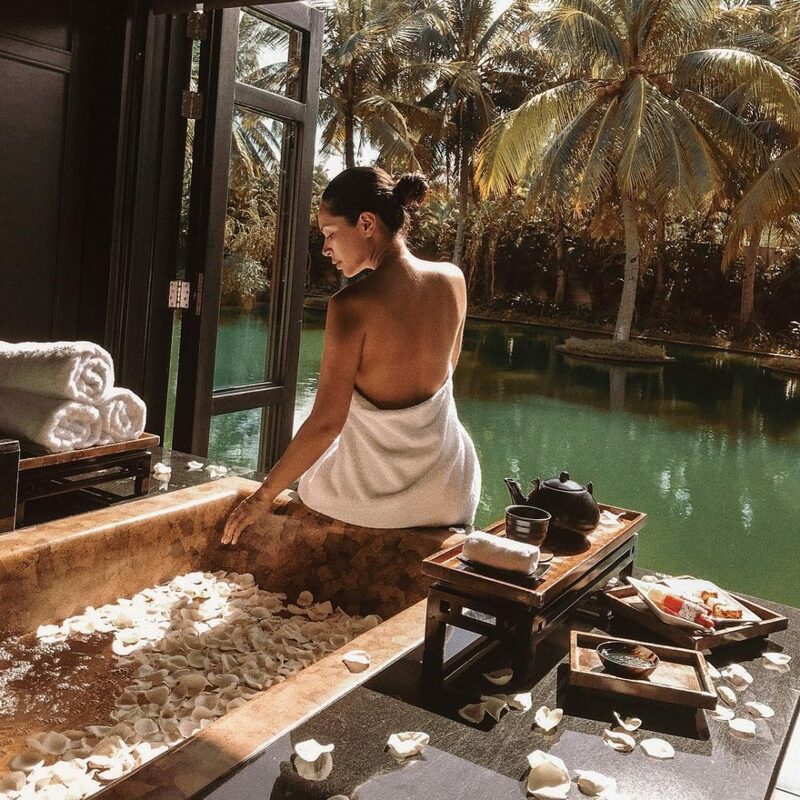 Marina Bay Sands: It was named the most Instagrammed hotel in the world in 2017 and for good reason. It has the world’s largest rooftop pool, which overlooks the city’s skyline. There’s also a museum, shops, shows, and more. Enjoy the beach: Take advantage of the many beachside properties and restaurants. The climate is tropical, so you’ll get to enjoy that seaside luxury if you go at the right time of the year. Spa Treatments: I was able to experience a Vietnamese body massage along with an equilibrium bathing ceremony. This was a great way to unwind and rejuvenate my body after spending a lot of time traveling. Candle Lighting Ceremony: Lighting candles are part of the offerings by Vietnamese families to their ancestors. Our resort had candleholders throughout the property and our villas for this purpose. Da Nang: This trip was extra special because not only did my mom join me, but we visited her home town. We also got to see her childhood home in Da Nang, where my uncle still lives with his family. It was such a special moment to see where my mom grew up and everything she sacrificed to immigrate to the US.